Inventory control software owned by the client is powerful enough to support companies with up to $99 billion a year in sales. The client offers a wide range of Inventory Software and accounting solutions, from a single user version to the 3000+ user SQL Client-Server Edition. STPL's experience in building applications in a distributed development environment was particularly useful. Client has been building the application over several years through its own development resources in Canada and taking help of some resources located in the Europe..
STPL's experience in understanding ERP based applications coupled with long technology experience of Dot Net technologies, made STPL as the natural choice for the client. This CRM application is a 100% Microsoft .NET- based CRM application suite which houses and automates all the critical business information an organization needs to develop effective sales, marketing and customer service strategies. History of all interactions with customers and prospects, on an individual or company-wide level, are contained in this powerful CRM software application. 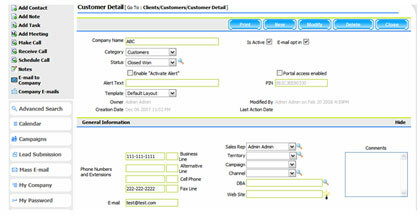 Also, included in the CRM package is marketing functionality complete with call center features. This will maximize the marketing dollars by allowing creating, executing, managing and tracking successful campaigns that increase leads and generate sales. This CRM application is easy to use. Designed with a logical interface, the instantly-familiar Microsoft look and feel and convenient tab orientation allows the team to navigate effortlessly through the system using the intuitive navigation tree and bar. User can view, edit and search for important customer data in record time. This ultimately empowers the organization to build stronger, more profitable relationships with customers and prospects. 1. Client required navigation and interface similar to Quick books. several criteria like item name, code or description was desirable. new entry or a change in the previous entry. like an actual transaction on a paper. letters typed in a textbox. 2. We provided the facility of creation of items using Ajax. taxes applied on that transaction. listed and calculated in one page.